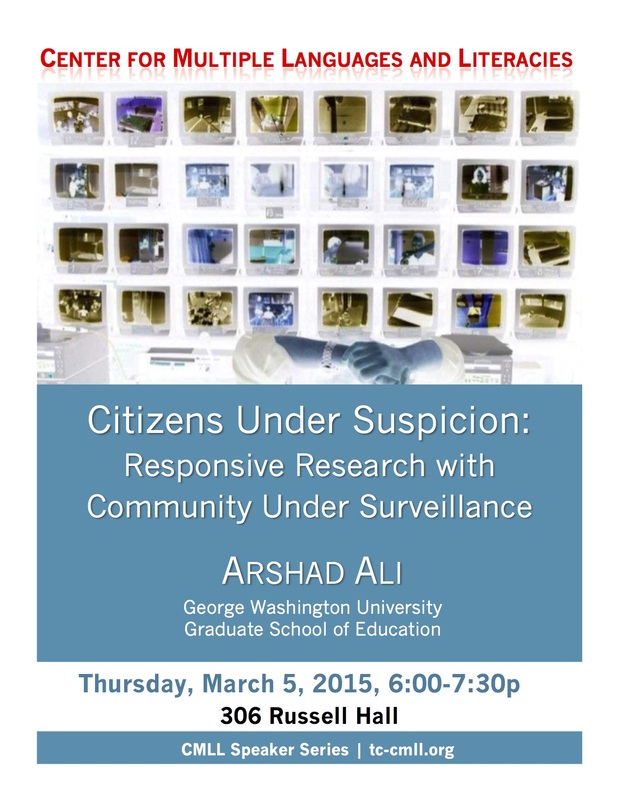 Professor Arshad Ali, from George Washington University, will be joining us on March 5th to speak about his research, which explores how marginalized young people make sense of their own identity and agency in an era in which state-sanctioned surveillance is part of their lives. Please note: The fireside chat will take place in a different room than the talk. In the 14 years since the 9/11 events, this nation as a whole, and New York City in particular, has escalated its state-sanctioned surveillance in the lives and activities of Muslims in the United States. In this talk, Dr. Ali will explores the ramifications of police infiltration and monitoring of Muslim student and community-based organizations. Drawing upon 24 months of ethnographic fieldwork among multiple research sites with Muslim youth in New York City, he examines how surveillance affected the relationships within communities utilizing notions of power, panoptic gaze and governmentality. Throughout the participatory action ethnographic study he found that an insidious result of the New York Police Department’s Demographics Unit has been the alarming rise of self-discipline behaviors amid a culture of fear and panoptic gaze, as well as diminished intercommunity trust and sense of solidarity among these youth themselves. Through the participatory action research process of data collection and analysis, these findings point to a need to reconfigure the roles and responsibilities of a social researcher. This lists two locations– which is it? Thanks. Thanks for your interest in our events! The two locations are for two different events: His presentation is at 6, and a fireside chat is at 4:30.